The TxLink3 can replace the colors used in a range of image data formats, including raster, vector, CMYK, and RGB. The target color is represented by specifying the color and lab values. Color patches on the chart can also be used as the target color. This function is useful if the printed color differs from the target color. The color data can be replaced to reproduce the target color. This function allows you to find appropriate color values for the target color. A similar color chart can be printed using the“ Print Similar Colors” tool in the“ Swatch Books” and“ Named Colors” dialog boxes. Select the most similar color patch and enter color values displayed under the patch. Color replacement is critical for textile printing. The TxLink3 offers simple color replacements on raster and vector data as well as the ability to produce different color patterns. 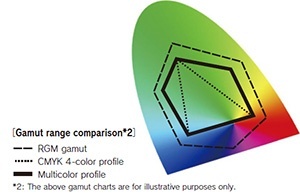 Various color replacement functions can represent desired colors. One large seamless pattern can be created from smaller image data. 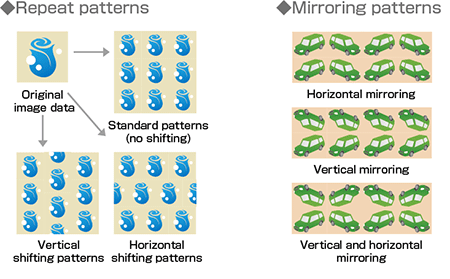 Furthermore, several shifting and mirroring patterns are provided to add design variation. A multicolor profile for CMYK and spot colors (blue, red, orange, and other colors) can be created. The profile is created automatically by following the instructions of the wizard. Operators only have to print and measure*1 the color chart. *1: Before measuring the color, please fix the color by heating. A colorimeter is not a standard feature of TxLink3. Spot color broadens the color gamut range and produces smooth print results. This function assigns color to each separated image data set*3 and combines them into a single image data set. Colors can be assigned from color values, the swatch book, and measured colors. The stacking order of layers is easily changed. *3: Image data that is separately created for each color. Logos, labels, seam and cut lines, texts, eyelets, and other images can be added using TxLink3 without the use of design software. Add logo file to the image. Alpha channels in the image (TIFF) are treated as transparent. Add seam lines with preferred width all around the image. Images outside of lines are mirrored to make the lines unnoticeable. *4: This function is activated in the standard and professional versions.